Wow. What a BIG week for my family. Last Thursday, I attended my CF clinic while my sister met with her surgical oncologist. It was a stressful day, to say the least. I was a nervous wreck as I did my PFTs (Pulmonary Function Test), anxious to hear what the surgeon was telling my sister at a nearby hospital in Chicago. I was anxious that my lung function would go down from the stress of the last few months, I was anxious about getting the approval to go ahead with infertility treatments next month, and I was especially anxious about whether or not my sister was all set for surgery to remove the cancer. I also had nothing to eat that day as it was the day before my colonoscopy and I was only allowed to have clear liquids. For starters, my body is stronger than I previously thought. Even with the stress of my sister’s diagnosis, my father-in-law’s passing, and my great-aunt’s passing, my lung function stayed stable. I was 85% this time (86% last time, which is considered unchanged). I was STUNNED. I never expected to be this high, but I was grateful. My oxygen was also at 100% on room air, and I sounded nice and clear. In addition, my doctor didn’t even hesitate when she told us to go ahead and start infertility treatments next month. Needless to say, it was a good appointment. My mom and I left thinking, one down, one to go. We headed back home to change really quickly and then headed to the local hospital. I was to be admitted for my scope prep due to the fact that I have a prolonged QT interval, and the doctors felt it would be safer for me to be on a heart monitor while doing the prep. I wasn’t thrilled about being admitted, but I went along with it. This was my first time overnight in a hospital since I was 17. I checked myself in, and I prepared for a long night of prep. Basically, I had to drink two 16 oz glasses of a strong laxative, and then follow that with 64 ounces of water. The prep tastes horrible, and the laxative effects aren’t fun, but it’s well worth it to get checked out when you have a family history of colon cancer. The first half of the prep didn’t go so well for me as I didn’t take anti-nausea meds prior to starting it. Once the nausea meds were on board, I was fine to finish it. The second half of the prep went just fine since we let the meds kick in an hour before starting the prep. I didn’t feel queasy once, and I was able to keep it all down without an issue. The scope showed that I had a polyp which was removed during the procedure. 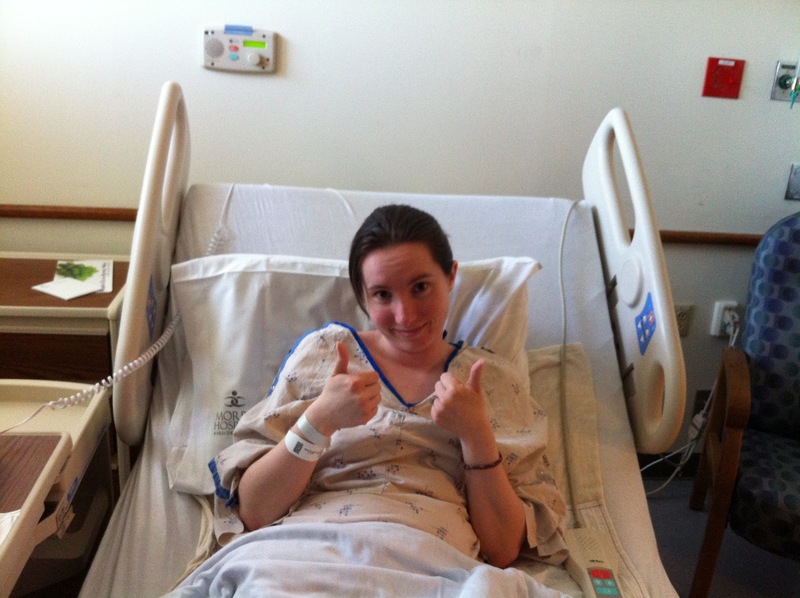 I wonder how long it would have been inside of me if it hadn’t been for my sister’s diagnosis. I had no pain, no issues, and no reason for a scope aside from my family history. The problem with polyps is that they have a tendency to become cancerous. This is why they are instantly removed when they are found during a colonoscopy. I’m so grateful that it was found and removed!! Due to the finding of the polyp, I will have to repeat my scope in three years to make sure I am still doing ok.
As for my sister’s news. . . .we actually found out about my sister’s appointment about four hours into my hospital stay. The surgeon said that he wants to go ahead with surgery in early June!! We’re so happy that they are setting up for surgery and will remove the tumor from the colon! The plan is to cut out half of the liver, and remove a good portion of the colon. It will be a big surgery, but my sister is a fighter and she will come through it with flying colors! The other half of my sister’s liver is in FANTASTIC condition, which is great because it gives it a higher chance of regenerating once the surgery is complete. The only problem is that in order to prepare for surgery, my sister has to stop chemo. The surgeon said that they will do a scope and a PET scan the day of surgery, but if anything has spread the surgery will be cancelled and she will have to go back to chemo. He called this a “leap of faith.” As we await the beginning of June, please keep my sister in your prayers and thoughts. We’re praying that the cancer does not spread anywhere else so that the operation can take place!